It was kc's family company day. Since we are near Melaka, decided to ask Kor join us so that can bring him around the place a little. This time my purpose was to look for food as recommended by food bloggers. Using Garmin and even Waze, we did find the place. Here is one excellent restaurant. Taiwanese beef/ pork chop spicy noodle. Beef is tender and pork chop is really good. 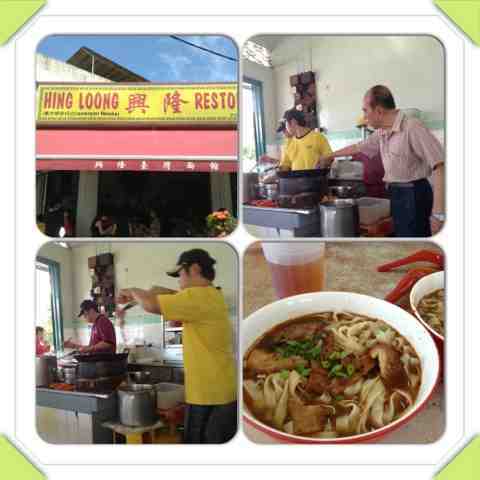 Am glad we found this place and tried the food. On the way to A Farmosa Resort, we stopped by this dusun. There is a shed with tables. People sit around the table and they are served durians!! The durians we are we very sweet and rich in flavor. I am a die-hard bitter durian fan but this was GOOD. Comes with the price too. 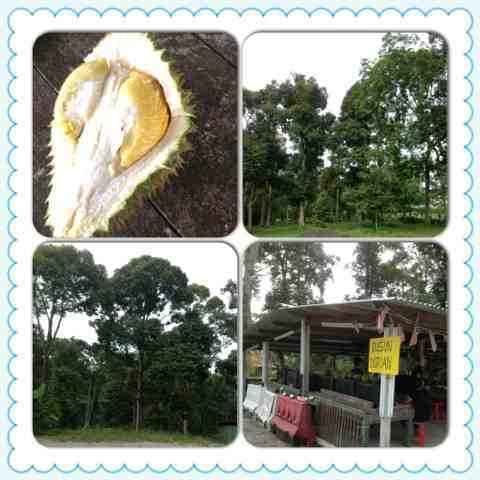 RM 18 per kg and we spent RM120 for 3 miserable durians!!! Met BS in church and she asked why I've not written for quite a while. I've been so mega BUSY. April was a bad month. Nelda went back for a month. Brother and sister came to relieve her. May....life is more normal but it's also exam month. English and history are bad combinations. I've completed two classes of English paper 2; essays and some structural questions. Earlier completed 3 classes of history paper 3. Marked like a zombie. Was disappointed that S didn't turn up for the paper. She did the same thing last year too. If she does it for SPM she's going to fail and that is bad for the statistics. Wanted to ask her not to come to school today too so she doesn't have to sit for her papers 1&2. I know I'm nasty but paper 3 is a breeze. I almost gave them the answer scripts ... What else does she want? Anyway....the students are in a frenzy themselves preparing for exam. 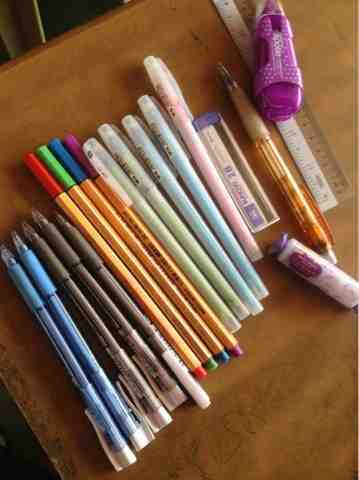 Managed to catch a picture of the stationary used by one of the girls. It was arranged like this. I only pushed them closer. The English paper which I marked. A sample of an essay from the weakest class. 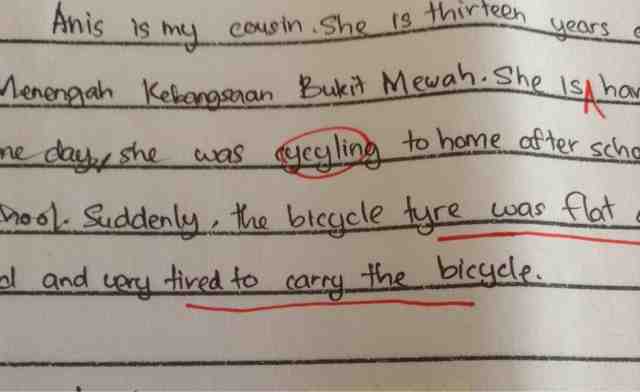 No wonder the writer was tired...had to carry the bicycle. Marking English essays can be fun. Lots to laugh about. One writer had to pull her bicycle home....like pulling a cow!! Here's a sample of history paper. 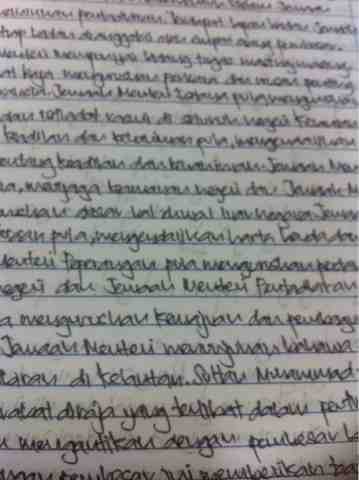 I dislike this type of handwriting. Too close...no paragraphing. 8 pages of this and my eyes can't focus anymore. In fact I don't even understand what I read as the words refuse to form in my brains. My next goal is to finish 2 classes of form 4 history and 3 classes of form 5 history papers before the holiday next week. It is a marathon. I have to do it or else suffer during the holiday which will be a busy time too cos lots of activities lined up already!!! !